SOUNDING MY BARBARIC GULP! : "...tastes like summer, and death." On her blog, "Lo" recently wrote about summers on the lake and making artichoke-stuffed French bread, which she says "tastes like summer, and death." Every year, I am so excited for summer break. This summer, though, I taught Writing Camp (creative writing for middle school & high school kids) all day for 4 weeks, taught college classes 4 nights a week for 8 weeks, and worked at the winery every weekend. Not much of a break. Like every year, I get nostalgic right after July 4th about how the summer is almost over, how I didn't get to do all that I had planned for the "break." Last summer, I wrote: "And now that July is here, I can glimpse the summer's end and feel my dreams of Summer Fun fading. I already mourn the sun. [...] The Fourth of July always signifies the midsummer mark for me...the beginning of the end, so to speak." So, I can understand Lo's comparison of summer and death. One night I stirred a scoop of thick vanilla ice cream, one spoonful at a time, into a huge mug of hot coffee. I drank it once all the ice cream had melted. THAT'S the kind of lazy eating I am talking about. More than anything, though, I remember picking wild blueberries in their backyard. There was always a big colander full in the sink . I ate blueberries all day long...in cereal at breakfast, handfuls for an afternoon snack, with ice cream for dessert. When I think of summer, I think of those bittersweet berries. Bittersweet...in so many ways...like summer, and death. My aunt & uncle no longer live on that farm. They are no longer married. I don't get to spend a lazy summer week with either of them. I've never eaten blueberries fresh off the bush since then. 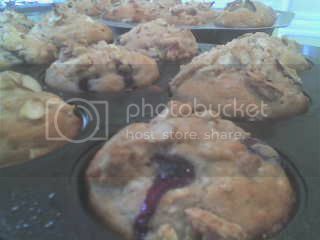 In honor of those lazy summer vacations, I made blueberry muffins this weekend...during a lazy Sunday morning. To make the muffins, combine 1 1/2 cups all-purpose flour, whole wheat flour, oats, sugar, baking powder, baking soda, and salt in a large bowl, stirring with a whisk. In a separate bowl, whisk together the yogurt, milk, oil, vanilla, and egg. Add the yogurt mixture to flour mixture; stir just until moist. 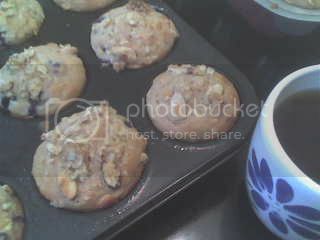 Spoon 2 rounded tablespoons batter into muffin cups coated with cooking spray. To make the topping, combine 1/4 cup all-purpose flour, almonds, brown sugar, and butter. Sprinkle evenly over batter. 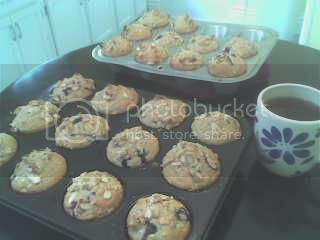 Bake at 400° for 15 minutes or until muffins spring back when touched lightly in center. Cool in the pans for 10 minutes on a wire rack; then remove the muffins from the pans.